What a rare treat when a work of art actually affects the course of everyday life for everyday people. 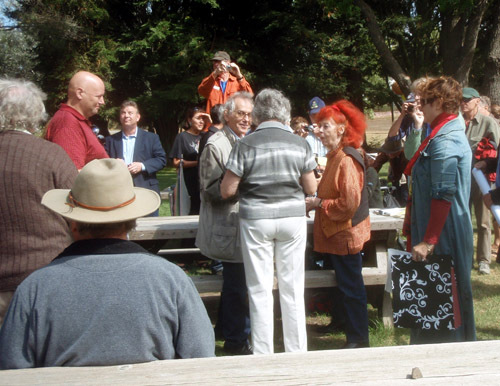 Dozens gathered yesterday in Bloomfield, West Sonoma County to greet the artists Christo and Jeanne-Claude and to celebrate the 33rd anniversary of Running Fence, which the duo spent four years planning and six months building for a two week installation in West Marin and Sonoma Counties in September of 1976. The gathering included many of the 59 ranchers who allowed the 25 mile long fence to run over their land, as well as locals who helped the artists construct and install the project. The feeling among the people was genuinely familial and it was truly touching to see Christo and Jeanne-Claude greeted more like old friends at a family reunion than as international art stars. Everyone present had a story to share about the epic project, recalled as though it had happened yesterday. I spoke with one man who had been a Team Leader on the Meacham Hill stretch of Running Fence, who gleefully recounted the challenges of securing the fabric clips when the winds picked up. I also spoke with the daughter of Mr and Mrs Les Bruhm, ranchers who were first to welcome the artists to the community, and whose cousin created a lovely scrapbook of the Running Fence project, proudly on display at the celebration. 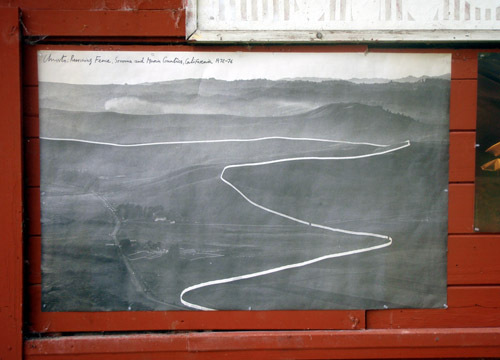 The Running Fence project clearly succeeded in calling people beyond their daily charge, inviting them to be a part of a unique historic event, whose legacy now resides in their collective memory. 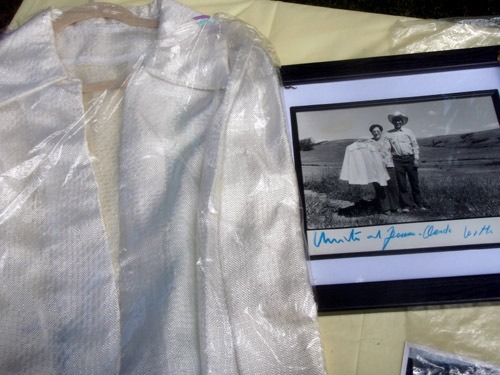 However ephemeral, a thing will last if its value translates across generations. 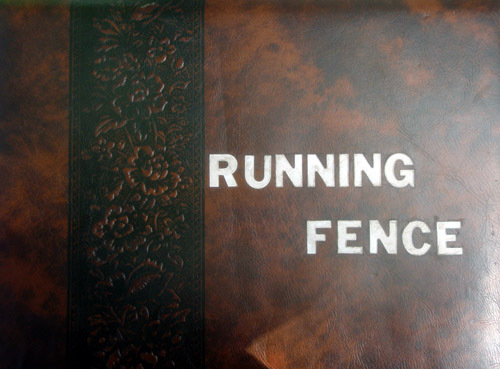 If you’d like to either contribute to, or follow my ongoing interest in documenting what remains of Running Fence, please follow the thread by clicking here. Posted by Scott on September 13th, 2009, at 4:50 pm, and filed under all, maintenance, Running Fence Revisited. « ASR Dispatch: Sustainability the New Cool?